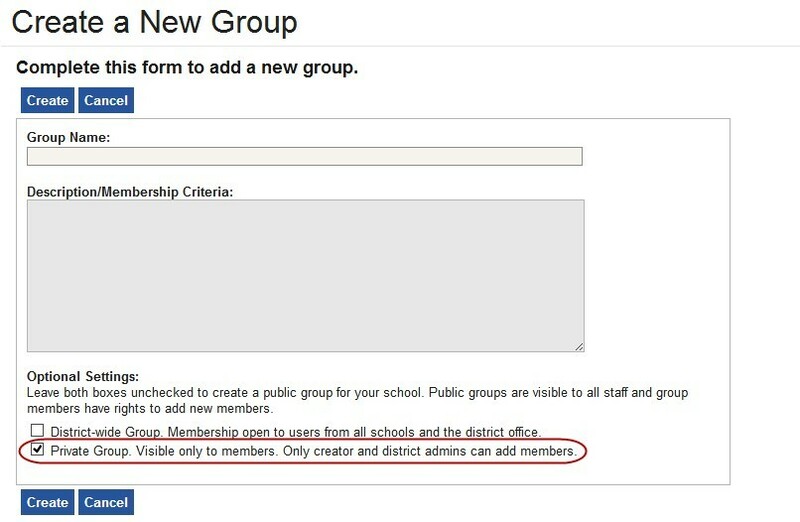 Our Unification feature allows districts to create Private and District-wide groups. Faculty and staff can now create private groups that cannot be seen by users who have not been added to that group's membership. With public groups, faculty and staff at a school site can see a complete list of groups at the school and are free to join any group they wish. Private groups allow for more discretion and control with regards to a group's membership, as new members can only be added to private groups by either the group owner or users with administrator rights. Creating a private group is easy -- simply click the Groups icon at the top of your portal and then click Create Group. At the bottom of the creation form, you will see a check box that allows you to make the group private. Checking this box will set your new group to private. Send LoopMail to Group is the one feature not available for District-wide groups. The following table outlines the rights the rights associated with private site and District-wide groups.